Are you aware that you can use honey as medicine? If you know how you can use honey as medicine, you might love it so much that you’ll begin to stock up cupboards with it. As always, please consult a medical professional before trying anything in this article. Why do I love honey as medicine? Once I became a dad, it has been a concern for me to use only safe products for my children, and of course that usually means natural. My research about the use of honey as medicine begun when I came upon some web articles about honey being used to treat diabetic ulcers, burns and other hard to heal wounds. It is fascinating that using honey as medicine can decrease pain as well as kill antibiotic-resistant bacteria and promote tissue healing, that’s why I became so interested in natural healing. So how does honey do all of the above? It does so by the following actions. Please see the below. Sealing the wound so outside contaminants can’t get inside. Makes the wound’s environment acidic, which most bacteria can’t thrive on. Changes the osmolality in the wound, making it a non-habitable place for bacteria to grow. Drying up the bacteria because honey has a high sugar content which causes dehydration. Producing hydrogen peroxide when diluted in body fluids. This amount of hydrogen peroxide is safe for human cells but it is enough to kill bacteria. Producing antibacterial chemicals which scientists are just discovering. Speeding up the growth of tissue by helping to form new blood vessels, producing collagen and epithelial cells. Providing nutrition to damaged tissue. Decreasing tissue inflammation, which is still being studied as of present time. 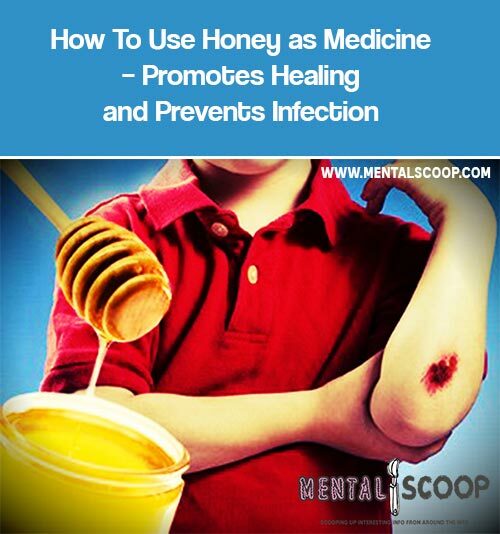 Before using the honey as medicine for a wound, make sure that the wound is cleaned first. Plain water will do if you are out in the wilderness or caught in a SHTF scenario. Put some honey on a piece of clean cloth or gauze. Even clean leaves will do if you are out of resources. Lay the cloth over the wound just like you would use some antibacterial ointment. Another way is to pour some honey directly over the wound and then cover it with the cloth or gauze. A good tip is to use duct tape if you don’t have surgical tape or medical supplies with you. Do the steps above twice a day until the wound starts to close up. Once it does, you can cut back on changing the honey bandage or dressing to just once a day. Honey as Medicine – How Safe is It? Although honey has been used for its medicinal properties for literally thousands of years, using honey improperly can cause problems. For example, using raw honey can be harmful for infants because raw honey can contain botulinum spores which may not harm adults but can harm babies. To be on the safe side, avoid using honey on children below 12 months of age. For everyone else though, using honey as medicine is safe and okay. There’s this new type of honey from New Zealand which is called Manuka honey. It is just normal honey but with extra bacteria fighting properties. You might want to store this type if you will be using honey as medicine for the long term.